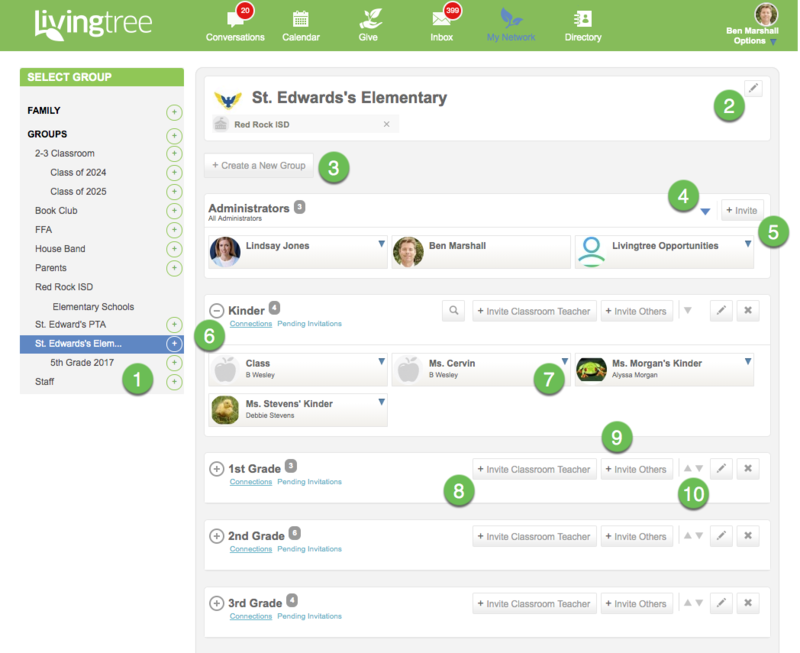 How to view/manage my school as an Administrator in Livingtree? Depending on your connections, you may need to filter your view on the school by selecting the school from your left navigation pane. Click the pencil button to rename your school or add a profile picture for your school. Clicking here will allow you to create a new layer or large group to which classes and/or staff can be connected. This will also create another group option for you to share with (similar to 1st grade parents, 1st grade staff, etc.). Clicking here will allow you to a) transfer ownership of the organization to another contact, b) download a list of active and inactive users, c) download the photos that have been shared in your school. The photos will be delivered to you by email in a .zip file (1 per class). To invite another administrator into your organization, click here. The admin will be able to share with your entire school (parents, staff) and will be able to edit/manage the organization and the content shared within the organization. Click the '+' button to view the classes and staff connected a particular grade group or function group. To delete a staff member or a class, click the arrow and select 'Delete.' Note, that deleting a class will only detach it from your school. The owner/admin (teacher) of the class must delete the class from their network. To invite a teacher into a grade group/function group, click here. The recipient will be able to create their class from your invitation. Once created, the class will be held in this group. Click here to invite a staff member to connect to the grade/function group. This invitation will allow the staff member to connect without creating/attaching a class group. This option is best for connecting the staff who do not own or administer a class. Use these options to reorder, rename, or delete a group. The name of the group will appear in your dropdown when you're sharing a post/event.